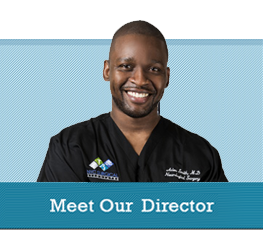 We have multiple surgeons with years of experience and specialized training. Each surgical case presents with a unique set of challenges specific to that patient. The patient is directed to the particular surgeon who can give each patient the best possible outcome. There are also multiple surgical sub-specialties within our group. This means that on many cases we will use a team approach and more than one surgeon will participate in the procedure. One example of this is when we have a plastic surgeon team up on a case so that there are as little visible scars as possible post procedure. We believe your surgery should not only be appropriately rendered but also cosmetically perfect to be considered successful. We bring the academic surgical expertise and combine it with private practice personal touch for an optimal experience.